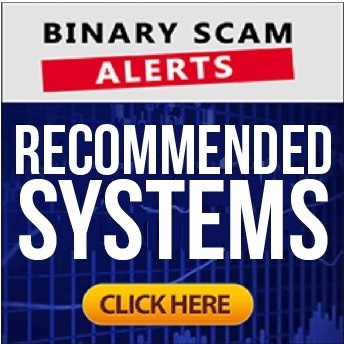 Binary Scam Alerts is issuing a severe SCAM warning to its members and viewers in regards to the Glory Trader Software (AKA Glory Trader APP) and Phillip Michaels. After conducting a full investigation of this fake app, our team of researchers reached some startling conclusions and fully agrees that it is unquestionably a filthy SCAM. Furthermore, it appears an alarming amount of day traders were victimized by this seemingly legit app, and lost their money to cheating offshore unregulated brokers. It appears that Phillip Michaels does not exist, otherwise he would show his face. There is also no social profile for this person who claims to have the “secret to making at least $1,000 profits during your first hour of trading”. Anyways, here are some facts you can’t ignore. Gregory Becker, Joseph Whiting, Summer Roberts, and Frank Kerr are all fake photos from an image bank. You can clearly see above the amount of false testimonials and scam tactics that are employed are enormous and I might add not very cleverly disguised. It appears the creators of this fraudulent app have a particular affinity for images originating in real estate websites, as you can clearly see Stephen Castillo is prominently displayed in a Cedar City Utah website called Cedar City Real Estate. I can continue all day and rip this scam apart into little pieces but I think the evidence is overwhelming and you would have to be completely blind to ignore the information as it has been presented to you and then proceed to buy into this obvious internet investment scam. These Cyber-criminals have clearly demonstrated gross misconduct and lack of ethical business practices. Looking at the image below you will find a screenshot of the Glory Trader software. 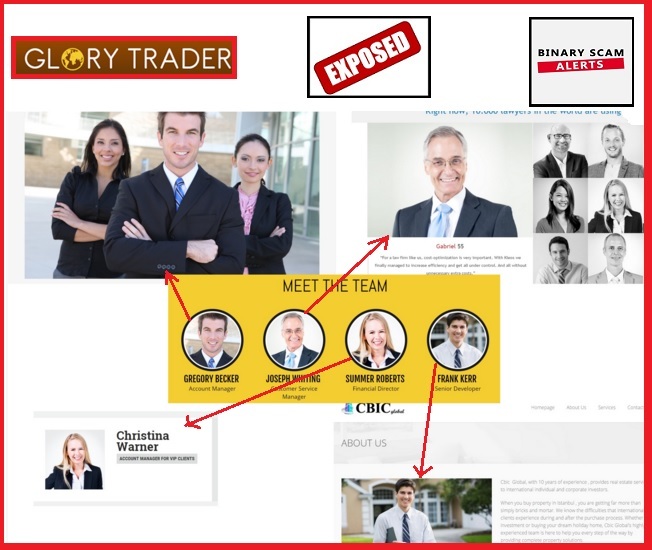 It’s plain to see it a complete replica of the Tauribot as well as Citidel LTD software, two of the biggest scams perpetrated recently by less-than-scrupulous binary options online marketers. If you still want to try out this software after reading all of this staggering amount of evidence you are either on drugs or not very lucid. Once you register and confirm your identity by sending over documents the app takes random positions and starts trading and losing automatically. There’s no need for charts or technical analysis. You are also exempt from market news and updates, all that won’t matter since the software is designed to take inferior positions and lose all your money in a very quick and efficient manner. As is the case in most products there is no fee and the system is provided at no cost. However, you are required to fund your trading account with a minimum amount of $250. These Include Insured Profits, Copy Buffett, Citidel LTD, Centument, Tauribot, Zulander Hack, Binary App 810, Channel Ranger, and the Free Money System by Walter Green. There is a plethora of systems available for anyone wanting to try his luck, and each one will surely promise you fields of gold and endless prosperity at the point of a click. However they are almost all fraudulent apps without any real proof of real performance or successful trades. However, if you are interested in a solution that has consistently proved itself you will want to read our Binary Profit Method review. If you insist on trying out an auto-trader then Virtnext is the only one I can recommend. I strongly recommend you do proper research before opting for a trading solution. If you see too much uniformity and everything looks the same, you can pretty much bet its a group of marketers getting kickbacks for referring traders. Look deeper and seek diversity of opinion and different styles of writing, that is how you will be able to separate the chaff from the wheat. 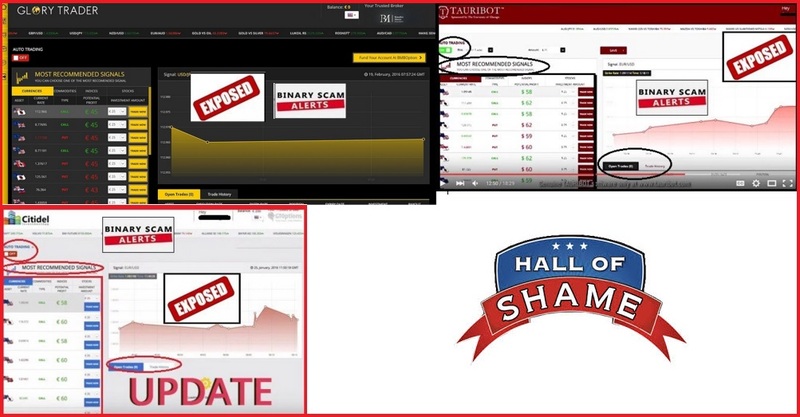 The Glory Trader software and App is a fake and fraudulent app. There’s nothing genuine, honest, factual, or sincere about it. If you were under the impression that you are about the make massive amounts of money on Auto-Pilot you are gravely mistaken, and we strongly urge you to reconsider before investing, and don’t forget to subscribe to our Facebook page and YouTube Channel.